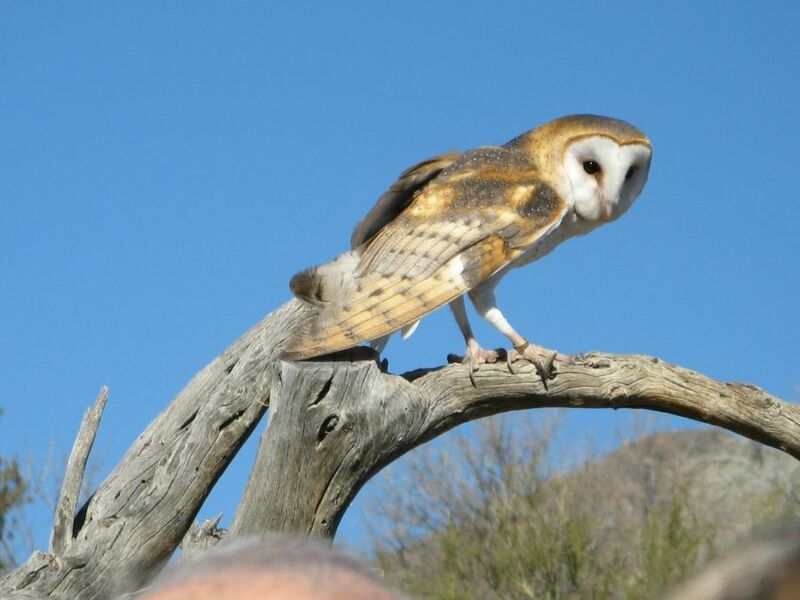 While I was in Tucson in February, I was fortunate enough to spend a day that the Arizona-Sonora Desert Museum. Despite the name, the Museum is really a bunch of things: botanical garden, zoo, aquarium, and museum, all dedicated to species that are native to Arizona. I’d visited once before when I was living in Phoenix in the 80s and what I remembered were the remarkable aviaries — huge netted areas you could walk through, observing the birds up close. But this trip, I was struck by the birds that truly fly free. 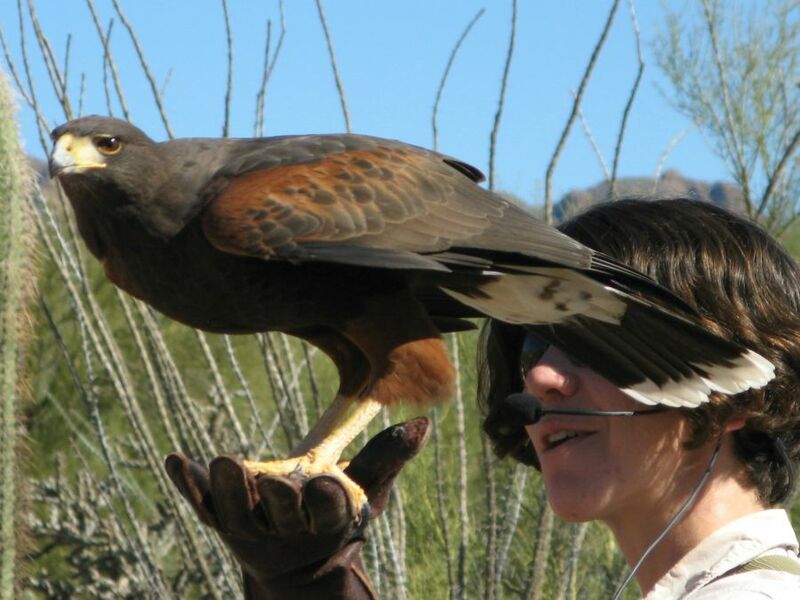 The Museum has two Raptor Free-Flights a day, and they are exactly what they sound like. 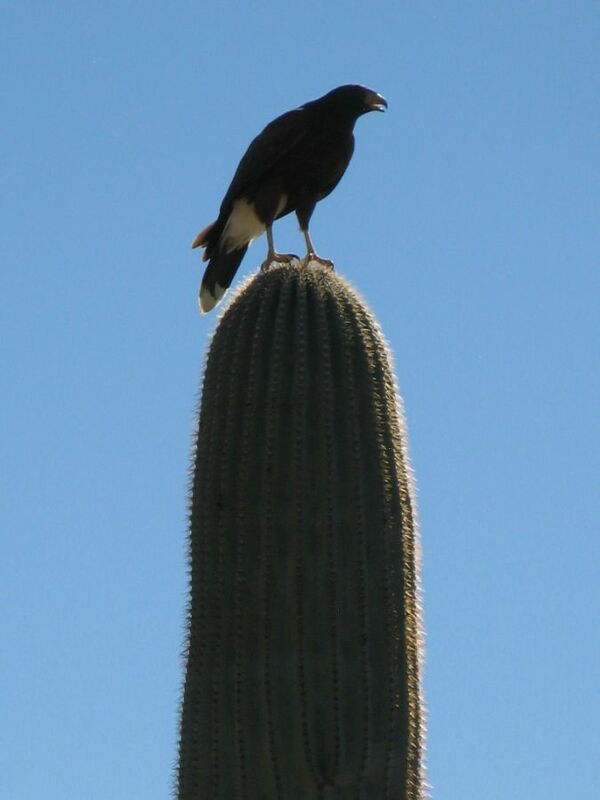 The birds fly into an open desert area and perch on the trees and cacti there, encouraged to do so by trainers who leave them treats. There are no nets, no jesses, no hoods, nothing to constrain or hold the birds in any way. The only fence is a railing to keep people on the section of path that the raptors fly over. Visitors are warned to keep their hands and cameras below their heads in case the birds come near, and it was good advice. The birds swooped right over us, close enough to touch. 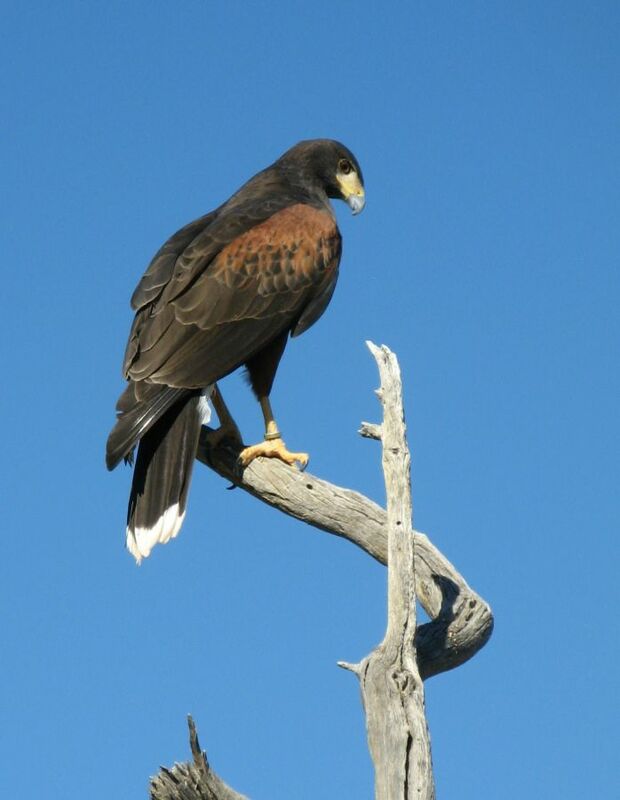 During the Free Flight we watched, they let out a barn owl, and then a family group of Harris’s hawks. While one of the trainers told us about them, the raptors perched nearby, flew overhead, and otherwise captivated those watching. The birds sleep in cages, but are let out daily. Sometimes they come out, sometimes they don’t. They aren’t forced to do anything. They are fed well, live comfortably, and given the chance to fly away and never return on a daily basis. But they don’t. Some were raised in captivity, but others started out wild, became injured and were rehabilitated. The trainer who spoke after the Free Flight was over told us that the birds have it cushy and know it. Apparently their instincts aren’t strong enough to inspire them to leave the museum for good. Just because it’s comfy in their cages doesn’t mean the birds come back right away. 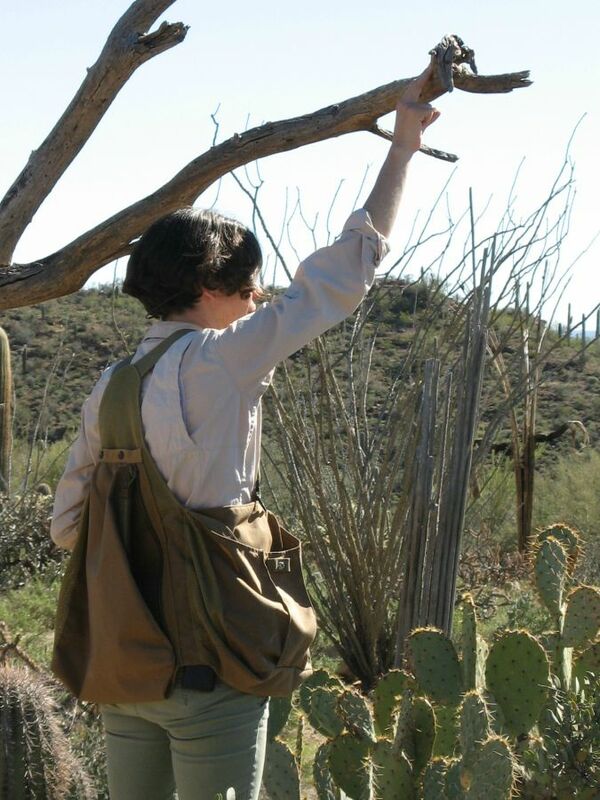 Occasionally, a bird will hunt and spend a few hours on top of a saguaro picking at the kill, or will spend an entire night sleeping out in the desert, ignoring the signal that tells the raptors that invites them to return to their home base. I was awe-struck by the faith the trainers showed in the raptors. They let them choose what they will do and trust them to come home again when they are ready. Watching the hawks circling together overhead and sensing how natural it was for them only made the fact that they do come back day after day all the more remarkable. They clearly love to fly. But life at the Museum is not to be discarded lightly. As long as they keep getting time to fly free and hunt if they wish, the raptors are content to return to their cages when day is done. They seem to know that the choice is theirs.